Stalls season 2018 is here! 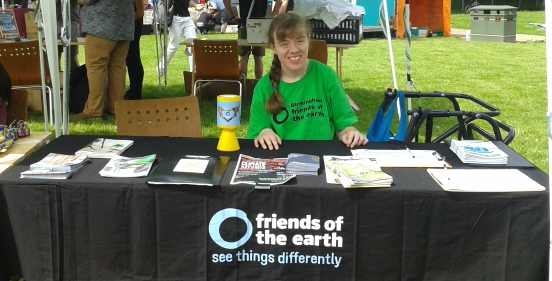 I’m Jodie, stalls and events co-ordinator at Birmingham Friends of the Earth. Stalls season is here once again and we are very much looking forward to it! We have confirmed our attendance at some popular events we have been to before such as CoCoMad and Moseley Street Festival and we will also be attending some events that we haven’t done for a few years. Look out for updates on how these went in our next newsletter. I’m delighted and honoured to have been asked to co-ordinate stalls and events for a second year. I am looking forward to using and building upon the skills I have developed in how to plan and oversee these as well as my experience of doing stalls myself. As we currently have four major, active campaigns I am keen for us to be strategic about which campaigns we promote at which stalls. With the help of others in the group, I will deciding which campaigns would be best promoted at which stalls based on what type of event it is and who the attendees are likely to be. We hope this will enable us to focus and target our promotion effectively and avoid competing information. A working group will be formed to help make these decisions and other decisions about which stalls and events we should attend. Look out for an update on how they are getting on with these tasks! If you would like to be involved in the stalls working group or to volunteer on a stall please email me at jodie@birminghamfoe.org.uk . Full training will be provided. I would encourage those who haven’t done stalls before to email me, even if it’s just to find out what doing a stall is like before you make a decision on whether it sounds like it’s for you. A massive thank you to everyone who has helped to plan or attended stalls so far this season. Onwards and upwards!